Last year’s opening is just a small part of a busy streak that the Ritz-Carlton Hotel Company has been on with the luxury-minded group having been pretty industrious of late. After the 2008 closure of their elegantly sophisticated property in Central Hong Kong the group went silent in Asia for a while, but now they are back with a bang, stylishly strengthening their Asia-Pacific arm – as The Ritz Carlton Hong Kong, and their latest properties in Shanghai and Okinawa, are showing. Recently, the brand has changed their positioning in the market slightly and there has been a subtle shift in their design philosophy and service evolution, which is now materializing across their stunning portfolio (particularly in the newer properties). Up on the top floors of the behemothic International Commerce Centre building, The Ritz Carlton Hong Kong is a testament to this fact, with the property featuring a forward-looking design scheme that includes tasteful fittings and refined ornamentation such as hand-tufted wool, earthen-toned carpets, hand-sculpted marble counters, plus organic motifs and timber walls throughout. Being honoured with the exclusive opportunity to set up a luxury hotel in the upper echelons of the International Commerce Centre building was no easy feat to live up to. 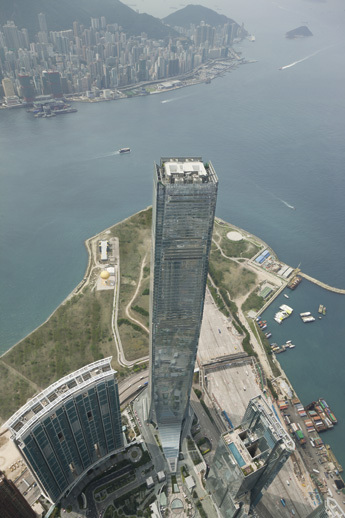 Positioned at a north-western tip of Victoria Harbour in Hong Kong, the building stands parallel to the International Finance Centre, located on a south-western edge on the other side of the harbour. The two lofty edifices resemble lighthouses or beacons and form a gateway on either side of the harbour. To emphasize the connection between the two, the delicately slanted notched facade of the International Commerce Centre slopes off at the base to enclose a soaring atrium, nicknamed the dragon tail. This dragon tail section emerges as a series of overlapping kaleidoscopically-arranged panels that connect to the building’s tapered corners and curves that spread out, visually anchoring the building to its surroundings. Off from these corners and set in the midst of this fine architectural backdrop is The Ritz Carlton Hong Kong, with the circular driveway that leads to the hotel entrance located by the dragon tail on the ninth floor on the property. While numerous leading investment banks take up the majority of the 232,252 square-metre Grade A office space in the building, The Ritz Carlton Hong Kong is the jewel in the crown at the top, with the property taking up floors 102 to 118. Elevators that reach speeds of nine meters per second zoom guests around the hotel, which has a lobby complete with a massive eight metre-high atrium of gleaming marble on the 103rd floor. At the time of completion the International Commerce Centre building was one of the tallest high-rises in Asia, and today it still holds a top ten ranking for the tallest free-standing structure and tallest building on the planet. While these records will soon be surpassed, the International Commerce Centre is still officially Hong Kong’s highest skyscraper and, soaring 490-meters above Victoria Harbour in the upper fractions of this cloud-touching property, The Ritz-Carlton Hong Kong can safely be pronounced as the tallest hotel in the world. At a measly 333 metres, the Rose Rayhaan in Dubai was the previous world’s tallest hotel, and while others are planned to come close – for now at least – The Ritz-Carlton Hong Kong will proudly remain as the highest hotel in the world. 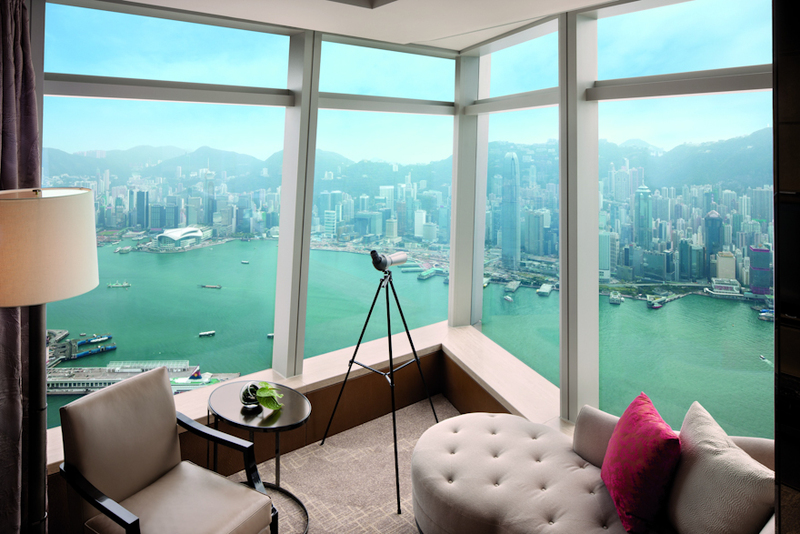 The sweeping 360-degree panoramas from the hotel are beyond comparison, with every one of the sleek modern-oriental-styled guestrooms featuring either views of Hong Kong’s outlying islands, Kowloon, Hong Kong Island, or, in some privileged cases, all of the above. The Ritz-Carlton Hong Kong is a hotel that turns people turn into ants and buildings into tilt-shifted structures of cards – a place where the world looks differently and where one literally stands above it all. From the 102nd floor, the hotel continues its vertical climb to the highest spa in the world, on the 116th floor, and on to the highest bar on the globe, the Ozone Bar on the 118th floor (which, yes, does have an outdoor terrace that provides the best place to take in the referenced almost god-like views onto the city below). The interiors of the property are just as impeccable as the exterior and, being a project of such exclusivity, many talented parties were involved in the outfitting of the hotel. While the overall design was overseen by New York-based firm Kohn Pedersen Fox Associates and Hong Kong’s Wong and Ouyang Limited, the public areas were taken care of by Singapore’s LTW Designworks. Meanwhile, the dramatic designs of the bars and restaurants were fittingly done by Japan’s SPIN Design Studio and Wonderwall. There are six food and beverage venues which start on the 102nd floor. The bulk these are located off from the lobby, uniquely arranged around the edges of the building and connected by a dramatically-illuminated walkway – complete, of course, with wine cabinets. Each of these venues also takes full advantage of the eye-goggling panoramas on offer, with large floor-to-ceiling windows maximising the views and the natural light. Possibly the most prominent of these outlets is Tosca, which is perhaps the highest spot one can enjoy an Italian meal in the world, and most definitely the highest place where one can enjoy an Italian meal of this quality. Named after a famous opera by Giacomo Puccini and decorated with a subtle water theme and a menu influenced by the coastal region of southern Italy, Tosca is an awesome balancing act for the senses, with a large open kitchen positioned as the heart and soul of the restaurant. However, the dramatic and slightly whimsical design setup from Japan’s Spin Design Studio competes against the kitchen for attention, with two central fountains with lotus-resembling sculptures standing on either side of the high-ceilinged dining room. There are also wavy water-like patterns on back wall panels and the top part of the windows, which are complemented by glass-beaded curtains, Italian-themed floor patterns and gothic-looking oblique spear-like branches on the large overhanging chandeliers. Off round the walkway conveniently connected to Tosca is the one-Michelin starred Chinese restaurant called Tin Lung Heen, which also features views into the kitchen and high ceilings ornamented with oversized chandeliers. However, while the views and design are still top-notch, diners will be hard-pressed to be distracted from the mouth-watering Michelin-rated dishes which include items like gold-dusted har gow and caviar-topped siu mai. The other food and beverage highlights in the hotel include the all-day Lounge and Bar where afternoon tea is served accompanied by live bands, a cute pastry shop called Pastry Gems which has options to take-out or dine-in, plus Café 103, a relaxed lounge where guests can enjoy desserts or the signature chocolate buffets. 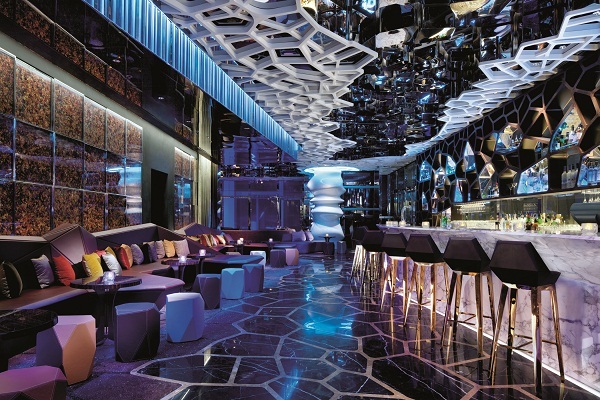 A mention of the food and beverage offerings would not be complete without a reference to the crowning glory of the hotel which is Ozone, the highest (and a good contender for quite possibly one of the most stylish) bars in the world. Vertically speaking, Ozone is the highest bar in the world – period. 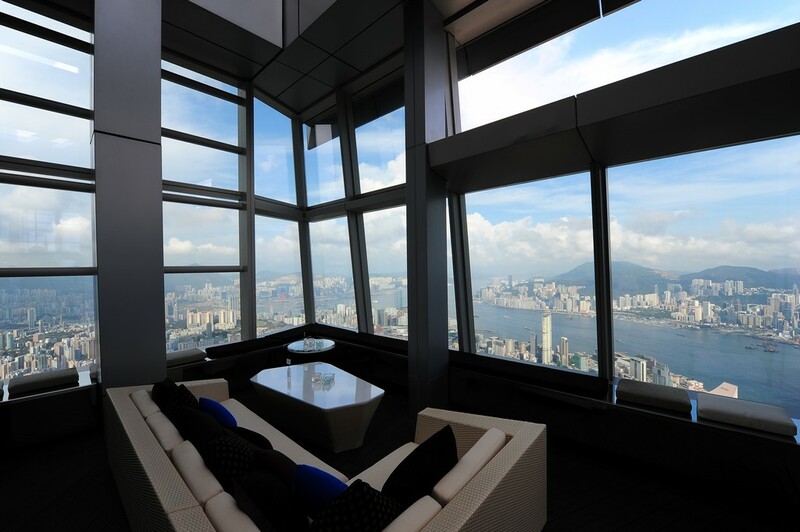 This alone is reason enough to visit the 118th floor venue, but thankfully this is not the only incentive, with the attention-grabbing views complemented by top-quality drinks and food, fine service, plus dazzling interiors. The interior design was overseen by Masamichi Katayama and his self-owned company Wonderwall, a design company with a difference that has an incredible catalogue of exclusive interiors, plus a Tokyo restaurant interior for Harrods and more. Wonderwall’s typical atypical design style can be seen all over the bar, with playful contemporary plastic features appearing alongside first-rate materials and creative mood-creating gilding. There is a distinct Alice-in-Wonderland vibe about the whole interior, which features blown-up inspirations of nature that become apparent through elements such as a neon colour-changing forest-like entrance, a beehive-resembling ceiling and marble-shaped bamboo. Outside, in the semi-al fresco area 12-foot walls of glass offer vistas of the city and enter in as the climax of the hotel with a light white ice theme taking over here. The discriminating design scheme continues into the 312 guest rooms and suites of the hotel, which were all styled with tailor-made precision by LTW Designworks to embrace the magnificent harbour and city view. Featuring contemporary touches and restrained oriental traces, high points in the guest rooms include silk-panelled walls, leather headboards with metallic accents, ‘baseball stitching’ on the leather and metal television walls, plus telescopes and bathrooms with travertine marble floors and onyx countertops. The hotel also boasts an 860-square-metre spa by ESPA, which comes complete with a glass-enclosed infinity pool, a ceiling comprised of 144 LED screens, plus nine deluxe treatment rooms and two couples’ suites. There is also a 24-hour fitness centre with an outdoor terrace and an extensive range of Technogym equipment. As the icing on the cake, privileged hotel guests will also get to indulge in the club facilities of the hotel which includes Ritz Carlton’s club signature offering of six daily food and beverage presentations. The design here is lushly homey, with gleaming white marble countertops delicately streaked with orange and grey counterbalanced by a dark Brazilian marble floor and mirrored columns near the windows. With such hype and exclusivity surrounding this property before it even opened the Ritz-Carlton Hotel Company had a lot of high expectations to live up to. Thankfully though – for those privileged enough to be able to tackle the vertiginous heights and enjoy a drink, meal or stay at the hotel – it is clear to see the group did a fine job, with the expectancy met and stylishly exceeded with ease. Originally published in Home Journal, November 2012.